If you don't find your answer on this page, please don't hesitate to Ask a Librarian! Access an electronic book owned by the library? Access library databases from off-campus? Access special Collections Borrow books from other Abilene Library Consortium libraries? Borrow library materials if I am not currently faculty, staff or a student? Borrow materials which are not available locally? Check out materials? Discuss a library bill for items that have been damaged or lost? Find materials owned by the library? Get research help? How long is the checkout period? Renew books online? Return materials? Place a hold on an item? Access an electronic book owned by the library? E-books are listed the same way as hard copy books. In the hit list they will be indicated by [electronic resource] after the title. In Research h Round up click on the left click on the “Retrieve Item from the Catalog” or if you are already in the catalog click the “Where Is It?” button for the item. The click on the appropriate URL to link to the book. Once you click on the link a new window will open for the e-book. From the Catalog: E-books are listed the same way as hard copy books. In the result list they will be indicated by symbols beside the word Format with a downward arrow. Click the purple Download button on the right-hand side to begin the checkout process. You will have to enter your User Barcode number and your PIN. From Research Roundup: E-books are found within the search results and will have the word eBook written under the cover of the book. Click the PDF Full Text link to open it, or click the title and then PDF Full Text on the left-hand side. Once you click the PDF link, the book should open. Access library databases from off-campus? Go to the HSU website. Click on the library link at the top right of the page, right above the search box. After typing in your search terms and hitting enter, you will be prompted to authenticate. This is done 2 ways: 1) click the authenticate button and enter your HSU username and password (the same you use for HSU Central) 2) enter the barcode number on the back of your HSU ID card. Please come by the Circulation desk or contact us @ 325-671-2151 if you need to activate your ID card. Most of the library special collections are not open to the public. The Richardson Research Center for the Southwest is open from 8am-5pm on weekdays. Please contact the Special Collections Manager Mary Burke to schedule an appointment or if you have any questions at 325-670-1239. Borrow books from other Abilene Library Consortium libraries? You may check out materials with your HSU ID card in person or see the FAQ on placing a hold. Borrow library materials if I am not currently faculty, staff or a student? The library honors cards from the other Abilene Library Consortium Libraries, TexShare and also issues HSU Associate cards for $20 per year. Ministers at churches that are affiliated with the Baptist General Convention of Texas may get Associate cards at no cost. Borrow materials which are not available locally? There is a service called Interlibrary Loan in which we will send requests to other libraries outside Abilene for items that you cannot locate locally. There is a form on the library webpage in which you provide the required information to make the request. A current HSU ID card is your library card. For other Abilene Library Consortium libraries your college ID or Abilene Public Library card is used to check out materials. Discuss a library bill for items that have been damaged or lost? Find materials owned by the library? Click the tab Library Books & More. This search includes everything in the Abilene Library Consortium catalog. If you are unsure about what to search for, or just need access to the catalog, you can blank search to bring up the catalog. There are several options. You may come into the library in person and ask at the Information desk or the Circulation desk, click the green Ask a Question button on the right-hand side, or click Ask Us at the very top of the page above the HSU logo. From that page you will have access to call the Reference Desk, email the Reference Desk, or text a question to Text A Librarian. How long is the checkout period? HSU undergraduate students have a 3 week checkout period on most HSU library materials. HSU graduate students have a 4 week checkout. HSU faculty may check out materials for 17 weeks or the length of the semester. Some other materials such as media materials have shorter checkout periods. Other Abilene Library Consortium patrons get a 3 week checkout on items that circulate to them. Place a hold on an item? From the Catalog: Click the purple Place Hold button, enter your User Barcode number and PIN, then chose a pick-up location, and click the blue place hold button. You will be notified via email when your item is available for checkout. From Research Roundup: Click on the title of the item, then the blue text on the left-hand side “Retrieve Item from the Catalog”. On this screen, click the purple Place Hold on the right side of the screen. Enter your User Barcode number and PIN, and choose a pick-up location, and click the blue place hold button. You will be notified via email when your item is available for checkout. See View My Library Account above. You may renew online if the item does not have a hold on it, is not overdue, or hasn’t been renewed more than two times. If the item is overdue, you will see a red icon next to the book image, check the box, then hit renew and confirm it. Materials may be returned at the Circulation desk in the Richardson Library or the Smith Music Library. There are also outside book drop locations on the front (northeast of the door) and in the back (west side in the driveway) of the library. Materials may also be returned at any Abilene Library Consortium location. In bottom left of the library page click on Check Your Library Account. 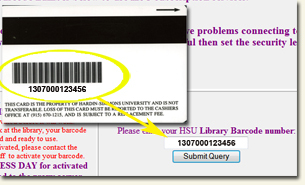 Log in using the barcode on the back of your HSU ID card and your library PIN (last four digits of your Social Security Number). After that you should see four tabs: Personal Information, Checkouts, Holds, and Fines. From these tabs you are able to access all of your library information. View an Ebook on my mobile device? Which portable devices are compatible with eBooks on EBSCOhost? How can I print or save eBook pages as a PDF? How can I send saved eBook pages in PDF format to my Kindle device? How can I download eBooks to an Android device and read them using the Aldiko Book Reader app?